This winter is one for the record books, with weather so cold in the Northeast, it even stopped Niagara Falls in its tracks. An unexpected reminder of how dependent we are on the grid for warmth, water, and, of course, the ability to produce hot food. While I’d normally advocate shoveling a path to the grill to cook when the power’s out—easy for a Miami-based guy to say, right?—no one should be outdoors in dangerously cold conditions. But you don’t have to forsake the satisfying flavors of smoke and fire: all you need is a wood-burning fireplace. 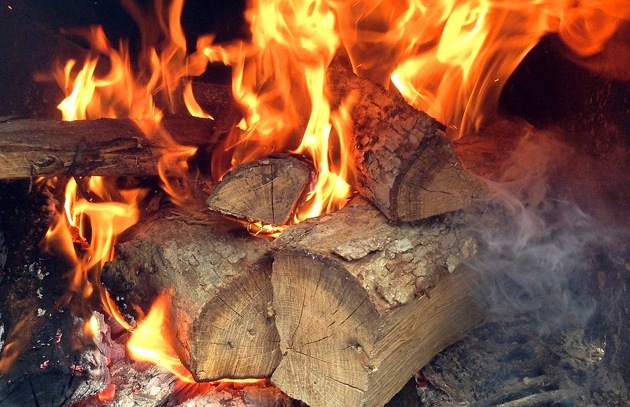 Not only is fireplace grilling a useful skill—there’s something satisfyingly primeval about gathering around the fireplace, watching the flames flicker, hearing the log crackle and shift and the embers pop, imbibing the intoxicating aroma of wood smoke. It’s urban survivalism at its best and it instantly takes you back to our cave-dwelling forebears. To this, add a meal cooked over a wood fire in your fireplace, and your family will almost regret it when the power flickers back on. As in outdoor grilling, it all begins with lighting your fire. However, you need to do so, not 15 or 20 minutes, but 1-1/2 hours ahead. Lay 3 to 4 split logs on the log dogs, leaving a little space between them for good air flow, and put kindling under and in the spaces between the logs. Light the fire using crumpled newspaper or a paraffin starter. Please note: I’ll assume you are diligent about having your fireplace and chimney inspected and cleaned annually by a professional and follow all commonsense safety rules regarding indoor fires. Once you have a mature fire—i.e. the inaugural logs have largely been reduced to embers—the fun can begin. Set up a Tuscan grill in your fireplace. (It’s a cast iron grill grate on legs.) Shovel or rake embers under the grate and arrange steaks, chops, whole fish, vegetables, etc. on top. That’s the traditional way to cook Tuscany’s magnificent bistecca alla fiorentina—in a fireplace over a log fire. It’s also the traditional way to toast sliced bread (preferably from a saltless Tuscan loaf) to make classic Italian bruschetta. Arrange a row of firebricks in front of the fire, and position whole onions, squash, potatoes, yams, etc. on top. (Use crumpled aluminum foil rings or our Best of Barbecue Grill Rings—to hold them steady. Roast in front of the fire until darkly browned on the outside and tender inside (test with a bamboo skewer), turning the vegetables with tongs so they roast evenly. You can also imitate the grateless mangal style of cooking popular in so many of the world’s grilling cultures by balancing skewers of meat and/or vegetables between the firebricks. Replenish the embers as needed, shoveling or raking them under the skewers. You can also adjust the heat by moving the food closer to or further away from the embers. Several companies manufacture and sell fireplace rotisseries, making roast chicken, leg of lamb, pork loin, and other meats possible. (Remember to put something underneath the meat, such as disposable foil pans, to catch drips.) This style of cooking relies both on heat from the embers and on radiant heat from the main fire. Are you inspired to try this ancient cooking method? For more than 250 recipes that can be adapted to fireplace grilling, check out my book Indoor! Grilling. Sign up for our newsletter, Up In Smoke, to get more recipes, grilling tips, and live-fire advice in your inbox every other week.